Learn more about in-store events & stay up-to-date on local events within our community. Howe Lumber installed an 89- kilowatt-hour system on the entire back roof of its primary lumber warehouse. The company is among a wave of dealers in Massachusetts that have brought solar systems on board in an effort to reduce expenses while making the most of lumber storage facilities with plenty of untapped energy potential sitting on the roof. Read full NRLA story here. Although no timetable has been set, Howe Lumber is looking to consolidate operations so that drivers don't have to go to both locations to fill an order. The Massachusetts Retail Lumber Dealers Association honored Ben Tedesco with the 2014 Lifetime Achievement Award. EAST BROOKFIELD — When Scott Norrie walks around Howe Lumber’s bright design showroom or vast lumberyard, he nearly always spots a customer he knows. Most often, Mr. Norrie, co-owner of the 53-year-old family lumber business, sees contractors who make regular pickups. Sometimes, it’s a local homeowner needing tools for an emergency project. And on occasion, he said, a customer will buy a new kitchen to replace the old one purchased from Howe decades earlier. “It’s important for us to maintain those long-term relationships,” Mr. Norrie said during an interview at the West Main Street showroom. Those loyal customers have helped keep Howe afloat all these years, sustaining it even in the shadow of the ubiquitous big-box stores. But for the store to thrive, Mr. Norrie and his wife, Kate Norrie – daughter of late co-founder Stephen Howe – have had to evolve. Not only does the Howe Lumber of today look different from the business that Ms. Norrie’s father and grandfather Henry Howe ran, it also has slowly shifted its priorities. Two years ago, Mr. and Ms. Norrie found they could no longer afford to operate two locations, so they decided to consolidate, closing the retail store at 555 East Main St. that Stephen Howe opened in the mid-1970s. With the entire business now at the showroom, built in 2005, the Norries have placed more emphasis on design and hardware, including selling new products like pellet grills and fire pits. Howe now offers some 40,000 different products, Mr. Norrie said, which has led to an increase in hardware sales (last year Howe recorded 60,000 transactions). Over the years, Howe also expanded its showroom and hired more people with design experience. Along with its sales team, drivers and yard workers, Howe has brought in kitchen and millwork designers to work with customers and guide them through their projects. The lumber store employs 42 people, and many of them have worked at Howe for more than 10 years. Mr. Norrie said the focus on design – including cabinets, kitchens and windows – also means Howe is better equipped to meet the demands of its savvier customer base. 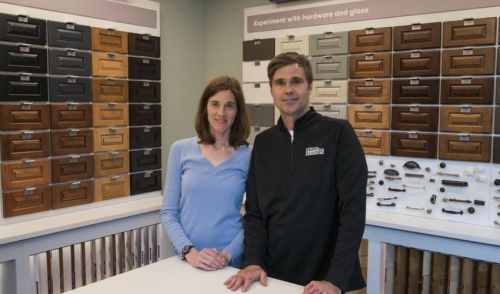 Given the popularity of shows on HGTV and prevalence of do-it-yourselfers, he said he can usually expect a customer to know more about home design than even his employees. Howe’s customer base is made up of about 65 percent contractors and 35 percent homeowners. While that split has remained consistent through the years, what has changed is women seem to be dominating the market more than ever before, taking over design decisions, according to Mr. Norrie. But amid its shift to design and hardware, Howe has not forgotten about lumber. The Norries recognize that they’ll never have the capacity to stock as many hardware products as the big-box stores. But with lumber, they said, Howe has an edge. Howe has up to $800,000 worth of lumber at its yard, Mr. Norrie said, and it can continue to restock with the help of a vast network of other independent lumberyards throughout the country. Most small, family-owned lumberyards like Howe belong to large buying groups, he explained, giving them the capital to purchase better grades of lumber. Howe is a member of the Lumbermens Merchandising Corp., a national group that includes 1,300 lumber dealers. In competing against big-box stores, Mr. Norrie said, Howe’s greatest asset is its reputation. And the store’s record of service allows it to retain customers and attract new ones like Phil Brennan. On a recent visit to the store, Mr. Brennan of West Brookfield was browsing for supplies to remodel his kitchen. Local contractors had steered him to Howe when Mr. Brennan called seeking advice. Howe’s employees can also appreciate its more personal brand of service. Jorge DelGado has worked at the lumberyard for 16 years and now heads its service and repair department. Mr. DelGado never considered working for a large corporation such as Lowe’s or The Home Depot, he said, because he would not feel the same connection to the company and its leadership. To read the original article by Matt Tota, click here.